See that poll above? I asked you what I thought was a very difficult question, but surprisingly, the answer was a very easy choice to make. This was a Popularity Question. I wanted to know how many people would prefer sticking to something popular like Emma or Emily, and how many people would opt for the bolder, rarer choices like Emerald and Emmeline, with Emilia tucked safely in the middle. 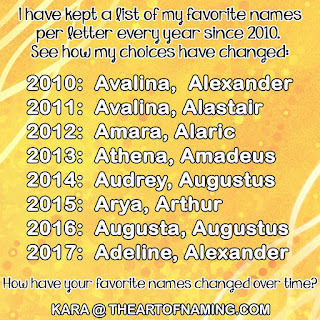 Emmeline is destined to be popular in the coming years and its because of the popularity of Emma and Emily, as well as the popular -line names like Caroline and Madeline. Parents love the Em- but want to be unique, so Emmeline is a great choice! It is a French name that comes from German elements that mean "work." It ranked just outside of the US Top 1000 in 2012 at #1078. For now, it is a rare gem but don't be surprised if it hits the Top 1000 next year and continues climbing upward! Click here to read even more about this lovely choice. The name Emerald does indeed come from the word for the green precious stone, which is the birthstone of May. The emerald supposedly imparts love to the bearer, which can only make the name that much more desirable. In 2012, there were 145 baby girls and 6 baby boys born with this name. The girls ranked in at #1518 in the US. Emilia has been gaining popularity for decades and has finally crossed the 1000 births-per-year milestone with 1,207 girls born in 2012. It ranks in at #268 in the US; both of these statistics are record-highs. Emilia is the feminine form of the Roman Family name Aemilius which was derived from Latin "aemulus" meaning "rival". Like Emilia, Emily comes from the same Roman Family name and has the same meaning. It was brought to England in the 18th century. It was thought to come from the German Amelia, since Princess Amelia Sophia (1711-1786) was called Emily, but the two names are unrelated. Emily was always moderately used, but began its ascent to the baby-name throne in the 1970s, hitting the #1 spot in 1996. It was finally usupred by Emma in 2008 and has been sitting comfortably at #6 for the past 4 years. Emma is not as popular as Emily in modern times. It was only the #1 name in the US for 2008. However, Emma wins the popularity contest around the turn of the century. It ranked in the top 10 from 1880-1897 and had its own baby-boom around 1920. It lost a bit of steam from the 50s to the mid-80s, but definitely gained momentum again by the 90s. The 2000s and the 2010s continue to produce thousands of baby Emmas and I don't see it slowing down anytime soon. I happen to love the name! However, Emma is not related to Emily. It is originally a short form of Germanic names that began with the element "ermen" meaning "whole" or "universal". Which did you vote for? If popularity was not an issue, which name would you choose based on sound and meaning alone? 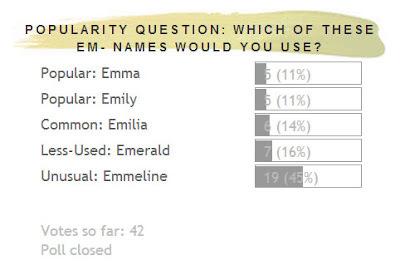 Emma is my ultimate favorite, but because of popularity, I would choose Emmeline instead. Let me know what you think!